During the past decade, camera systems have become affordable, computers that process data have become much faster and the industrial screen printing is more demanding. These are all contributing factors to the rapid introduction of camera control and registration systems within the screen-printing industry. Flat bed machinery that uses camera registration systems have been available on the market for over 8 years. SPS TechnoScreen and ATMA Champ Ent. Corp. are designing a complete series of camera control systems designed for before, during and after printing. The direct drive systems of the SPS ASTRON QX57 have replaced the complete mechanical main drive structure of the traditional SPS cylinder series. The print cylinder has a core integrated servo motor implemented inside of the cylinder drum. The screen carrier is driven by 2 linear motors which features a system similar to what is used for high speed bullet trains in Japan. Direct drive systems have virtually eliminated all chains and other mechanical drive connections. 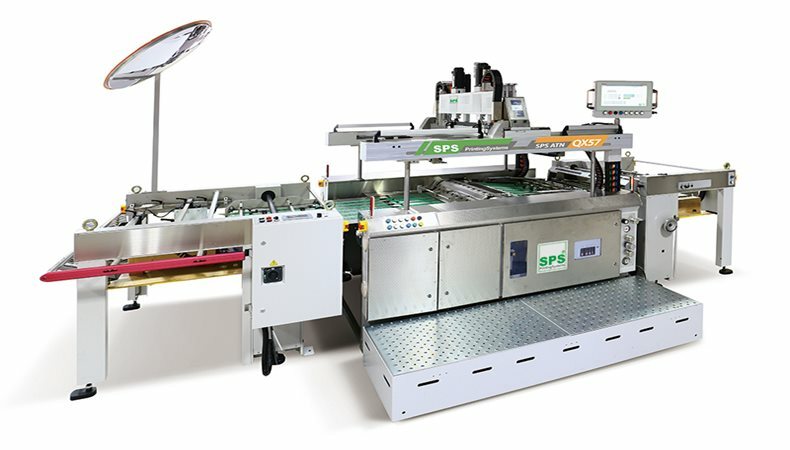 The separate drive systems of the cylinder and the screen carrier make it possible to freely implement “print elongation correction”. This means that images can be easily stretched or shrunk over the full length or in small segments. This is particularly beneficial when the material has deformed during earlier processes and/or drying. In addition, it’s possible to set different speeds for print and flooding actions which can further increase productivity. The SPS ASTRON QX series can be equipped with a camera registration system that matches the image position within the screen frame to the image position on each individual sheet. It is available for a maximum sheet size of 550 x 800 mm and features a single sheet front-pick-up feeder. The machine has a maximum production speed of approx. 2.000 iph. FESPA Global Print Expo 2019 is Europe’s largest speciality print exhibition for screen and digital wide format print, textile printing and signage solutions. Visit SPS TechnoScreen at stand A51 in Hall A6 at the Messe Munich between the 14-17 May 2019 and discover the available features. Please use promo code FESG902 to register for free.